We've been raising a variety of goats since 2010. We've learned so very much and, in 2016, we chose to direct our focus into Registered Angora goats. We had previously raised pygoras and had a few registered angoras already in the herd when we chose to add 2 dozen top quality angoras from Speck Angoras in Kerrville, TX. We are absolutely in love with these precious goats and the incredibly fine kid mohair that they grow so well! This is Evie. She's one of our Nubian (dairy-type) goats. 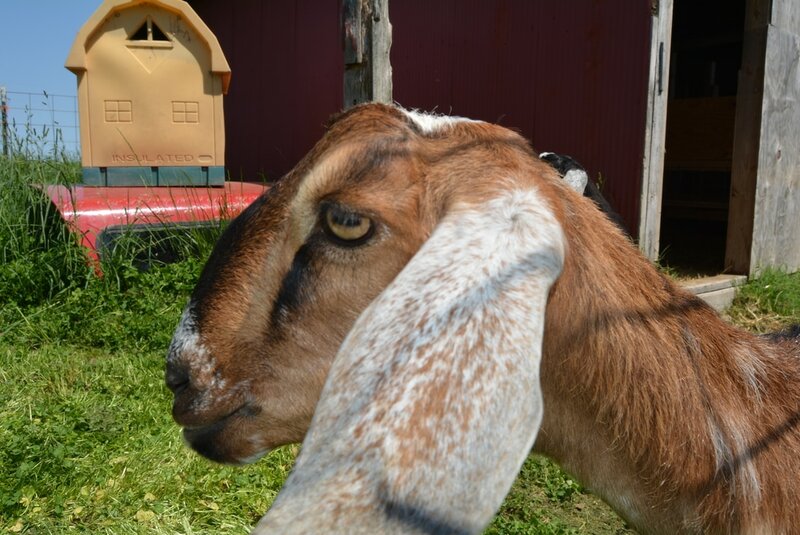 We added Nubians to our farm in 2011 and through all our growth and changes, we have always loved them. We continue to maintain a herd of about a half dozen Nubians. They provide milk for family use and are very peaceful friends when the world seems to be too hectic. One of our simple joys on the farm is watching our Silver Appleyard Ducks. They have so much character! Silver Appleyards are large, slow-growing ducks that serve a useful place on the farm by helping to reduce insect-pests in the pastures, barns, and gardens. After trying a variety of different chicken breeds, we have settled on raising primarily the large cochin chickens, although we also care for a few Brahma chickens and a couple of Silkies. We feel that the Cochins are most suited to our farming ways. Like, the ducks, the chickens serve a critically important task of reducing the insect-pest population and these guys do a wonderful job of it!